Sahi Pro Desktop Add-on provides support for automation of Java Web Start Application. infoTo open Java Web Start Application from Sahi browser, Sahi Browser capability should be enabled. Bring up the browser of your choice by clicking on any of the browser icons present on Sahi Dashbord. 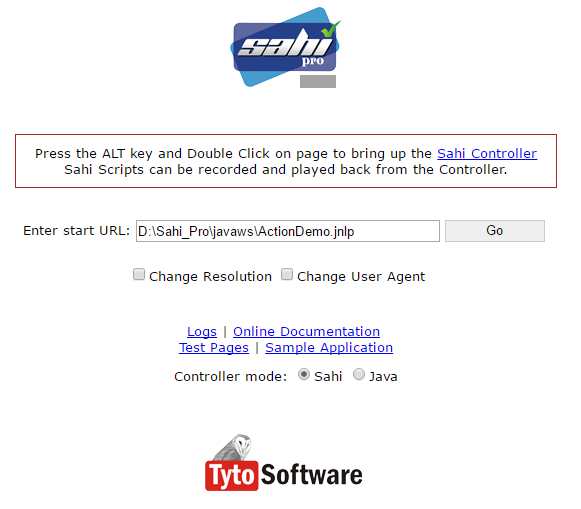 Launch the Controller by clicking on Sahi Controller link present on the Sahi start page. You can now start identifying/recording. Like normal Sahi Pro for web pages, you can use CTRL-Hover to identify various elements on the Java Web Start application. To Launch Sahi Controller, click the Desktop icon on the Sahi Dashboard. You can now start recording. Like normal Sahi, you can use CTRL-Hover to identify various elements on the Java Application. To use "Evaluate expression" on Java Web Start applications, choose "Sahi-Java". For script playback in Controller Playback tab, select Start Mode as "Java" before "Play". To start a JNLP file, use _launchJavaApplication($jnlpFile) API. To start a JNLP file, use _launchJavaWSApplication($jnlpFile) API.